March 31st in Wordpress Plugins by Wordpress Jedi . So you have something very important to share with your visitors? If you don’t display your information in a place people won’t miss, you won’t have too much success getting the word out about your announcement. AttentionGrabber for WordPress is a cool little plugin that lets you add a notification bar to WordPress to announce things on your website more effectively. Using this plugin, you can display custom texts, Twitter posts, and RSS feeds in your notification bar. This could be very handy for giveaways and limited time promotions too. 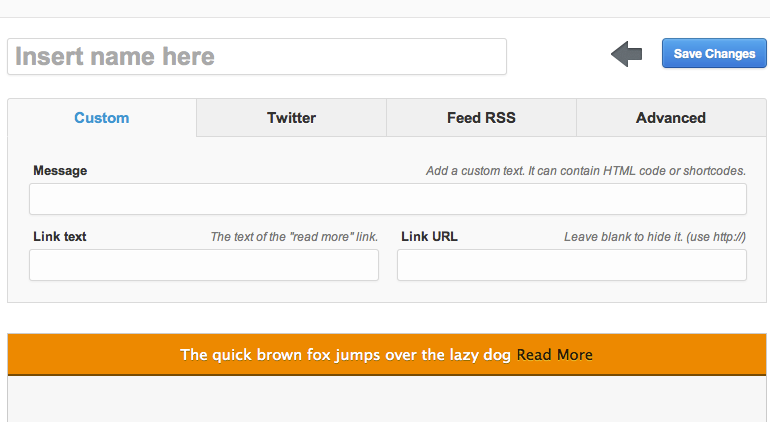 You could also use this to get more people to sign up for your newsletter or RSS feed. Your notification bar is highly customizable. You can change its background color, font size, height, and everything in between. You get shortcodes for Facebook, Twitter, and Google +1 voting. The plugin comes with 6 themes to get you started. It has a total of 7 shortcodes. While there are free plugins that offer some of these capabilities, the attentionGrabber plugin stands out for being highly customizable and user friendly.